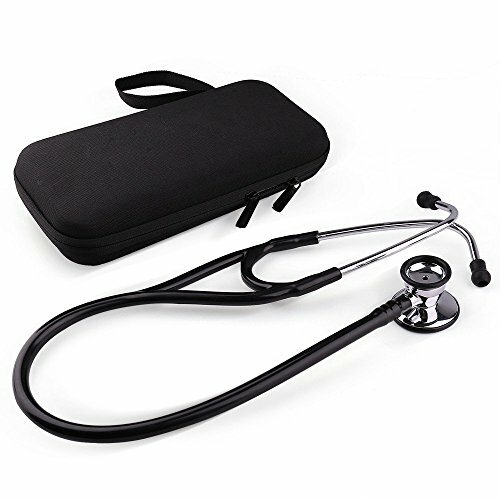 LotFancy dual-head stethoscope is an excellent stethoscope for general auscultation, providing high acoustic sensitivity through its dual-sided chestpiece, with a diaphragm on one side for high frequency sounds and bell on the other for low frequency sound. Headset tension can be easily adjusted for head size and comfort by squeezing together or pulling apart the eartubes. Screw-type eartips conform to individual ears for an excellent acoustic seal and comfortable fit. The LotFancy stethoscope is used by medical professionals and students alike to identify and study heart, lung and other body sounds, a reliable clinical tool for physical assessment, monitoring and diagnosis of adults.